The Los Angeles Dodgers visit Nationals Park on Thursday to play the Washington Nationals. The probable starters are Julio Urias for the Dodgers and Stephen Strasburg for the Nationals. The opening line for this matchup has Los Angeles at +185 and Washington at -200. The over/under was set at 8. The Dodgers have a 44-43-7 over/under record and a 43-51-0 run line mark, meaning they cover 46% of the time. The Nationals are 49-45-0 against the run line and have a 45-43-6 over/under record. They cover the spread 52% of the time. The Dodgers head into this matchup with a 53-42 record, including 23-24 on the road. Starting pitcher Julio Urias has a 1-2 record with an earned run average of 4.95 and a WHIP of 1.54. He has 44 strikeouts over his 36.1 innings pitched and he has given up 39 hits so far this season. He has allowed 9.7 hits per 9 innings and he has a FIP of 3.56. The bullpen this year has an earned run average of 2.96 and they have given up 221 base hits on the year. Teams are hitting .195 against the bullpen while being struck out 316 times and walking 104 times this season. As a team, Los Angeles has allowed 9.42 hits per nine innings while striking out 7.34 batters per nine. They are 20th in the league in team earned run average at 4.38. The Dodgers pitchers have collectively given up 699 base hits and 331 earned runs. They have allowed 89 home runs this season and they allow 0.9 homers per nine innings as a staff. Los Angeles as a pitching staff has walked 258 batters and struck out 905. They walk 2.7 men per 9 innings while striking out 9.5 per 9. They have a team WHIP of 1.12 and their FIP as a unit is 3.41. As a team, Los Angeles is batting .266, good for 6th in the league while putting together a .275 average away from home. The Dodgers hold a .413 team slugging percentage and an on-base percentage of .328 which is good for 10th in baseball. They rank 10th in baseball with 9.03 hits per game. Corey Seager comes into this game hitting .301 and his on-base percentage is at .360. He has 111 hits this season along with 63 runs scored and 43 runs batted in. He's struck out 79 times and has walked 34 times. Adrian Gonzalez is hitting .285 and he has an on-base percentage of .363. He has totaled 94 hits so far while scoring 34 runs and he's driven in 45. He has walked 41 times and has struck out 69 times. The Dodgers have 787 hits, including 155 doubles and 104 home runs. They've stolen 28 bases while they've been thrown out stealing 16 times. Los Angeles has walked 325 times this season and they've struck out 745 times as a unit. They've left 655 men on base and have a team OPS of .716. They score 4.31 runs per contest and have scored a total of 409 runs so far this year. Washington comes into this matchup with a 29-17 home record and a 56-38 overall mark. With an earned run average of 2.51, Stephen Strasburg has a 13-0 record and a 0.99 WHIP. He has 138 strikeouts over the 114.2 innings he's pitched during which he has given up 80 hits. He has allowed 6.3 hits per nine innings and his FIP stands at 2.91. So far this season the bullpen has an earned run average of 2.97 and they have given up 220 base hits on the year. Teams are hitting .222 against the Nationals bullpen while being struck out 282 times and walking 86 times this season. As a team, Washington has allowed 7.63 hits per nine innings while striking out 9.41 batters per nine. They are 1st in the league in team earned run average at 3.22. The Nationals pitchers as a team have surrendered 727 base knocks and 307 earned runs so far this season. They have given up 90 home runs this year and they give up 0.9 home runs per nine innings as a staff. Washington as a staff has walked 263 hitters and struck out 897. They give up a walk 2.8 times per 9 innings while they strike out 9.4 per 9. Their team WHIP is 1.15 while their FIP as a staff is 3.45. As a team, they are batting .250, good for 21st in the league while putting together a .250 average at home. The Nationals hold a .426 team slugging percentage and an on-base percentage of .325 which is good for 13th in baseball. They rank 19th in baseball with 8.49 hits per contest. 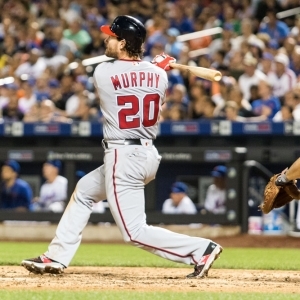 Daniel Murphy comes into this matchup batting .352 and he has an OBP of .390. He has 120 hits this year along with 54 runs scored and 68 RBI. He's struck out 38 times and has walked on 18 occasions. Bryce Harper is hitting .248 and he has an OBP of .390. He has collected 76 hits so far while he's scored 50 runs and drove in 52. He has earned a walk 72 times and has punched out 60 times. The Nationals as a unit have 798 base hits, including 150 doubles and 128 homers. They have 58 stolen bases while they've been thrown out 25 times. Washington as a team has walked 336 times this year and they have struck out 723 times. They've had 639 men left on base and have an OPS of .751. They score 4.66 runs per game and have totaled 438 runs so far this season.